If you've ever stumbled across the gold-digging escapades of NetEnt's slot, Boom Brothers, you'll know that the treasure-hunting theme has legs in the slots world. After all, what's more fun than following a bunch of jovial japesters on the hunt for treasure? Renowned developer Microgaming’s offering to the slice of Americana, the 5 reel, 25 pay-line slot, Moonshine, offers free spins galore and a maximum bet of $125. This wacky American family – rather reminiscent of the Beverly Hillbillies minus the cash – sit on the reels making moonshine (the illegal whiskey famed for its potency) while you spin the reels away. 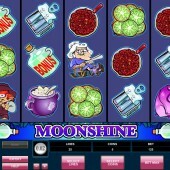 The top-paying icon in this slot is the shotgun-toting Granny. She sits in her rocking chair giving you dodgy looks as you play, and an 8,000-coin jackpot can be yours when you hit five symbols across the reels. Various family throwbacks....sorry, members, fill out the reels, with a pipe-smoking Rastus, a banjo-strumming Festus, the plait-twirling Marilyn, and the family pig (obviously) making up numbers. Elsewhere there are plenty of good ol’ country symbols like pumpkin pie, a pan full of beans, sardines and fried green tomatoes. Let’s get ready for a hoedown! The game’s Wild is the Grandma. She substitutes for all regular symbols than the Scatters. The Sheriff Scatter can pay out a jackpot of 60x your total bet if you hit five anywhere on the reels. But it’s the jug of moonshine icon that is the bonus Scatter that counts. 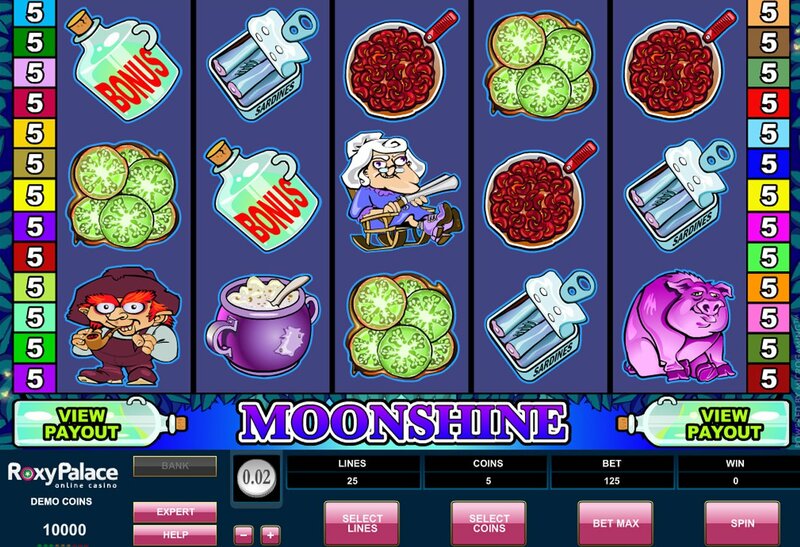 If you get three or more jugs of moonshine scattered anywhere on the 5 reel slot machine, you trigger the Moonshine bonus game. You will be presented with a grid of squares on your computer screen; as you pick squares you will be picking the number of free spins and the multiplier. You can win as many as 18 free spins at up to a 4x multiplier. But the bonus starts with three spins for three Scatters, four spins for four Scatters, and five free spins for hitting five Scatters. While Microgaming won’t win any awards for graphics, but the game is fun overall and offers plenty of chance for regular free spins wins. For some more lucrative spins action, and a tonne of cute animation, you can't really go wrong with Betsoft Gaming’s Black Gold if you get the whole Hillbillies angle here, while the aforementioned Boom Bros. Is another perfectly adequate alternative.